Late Wednesday afternoon, Towns County Sheriff deputies were called to respond to what was characterized by Young Harris College campus police as “a minor automobile accident” in front of Sharp United Methodist Church, immediately to the west of Goolsby Hall. While an ambulance was present at the scene of the accident, it left without transporting any persons. An elderly man was seen with a dime-sized laceration on his forehead, but otherwise he appeared fine. No other major injuries are known of at this time. No YHC students, faculty or staff are believed to have been involved in the accident. 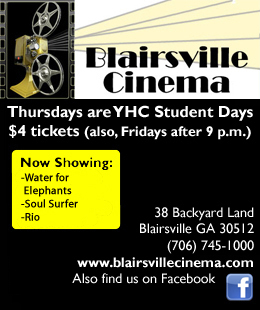 UPDATE1 (8:14 p.m., 09/22/10): Corrected location of Sharp UMC, added information about YHC to last paragraph. On August 31,the Campus Activity Board or CAB hosted an “Hang up and Drive” on the Plaza to raise awareness about the dangers of texting while driving. CAB hoped the event would persuade many Young Harris College students to put the phone down while behind the wheel. At the plaza the YHC Police Department set up a driving obstacle course where students would go through once while just driving, and then again while texting at the same time. Many students attempted the course and results varied, although most failed at the texting and driving part. If the student failed, the student had to sign a large sign stating, “I pledge that I will not text and drive.” After signing the statement, students then painted their hands red and put their handprint on a large banner. The red hand print symbolized the blood on their hands from driving while texting. . Along with an obstacle course, CAB provided a slideshow presentation through a projector. The presentation went through the facts and statistics about the dangers of texting and driving. The obstacle course demonstrated to several students the potential dangers of texting and driving. Many students were compelled to take the pledge. Students believed that the “Hang up and drive” event helped bring the attention to the new law and let them experience the risks involved. “I think that parking is going to be a problem and it is going to grow as our enrollment grows; it is something that needs to be addressed. I think other solutions need to be looked at,” said business and public policy senior Matthew Kammerer. 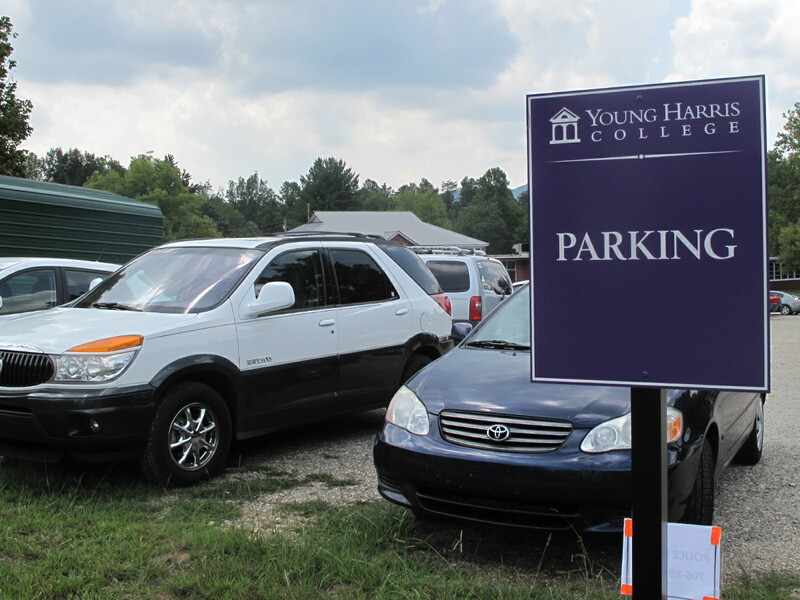 While Kammerer considers that enrollment at Young Harris College is at a record breaking high, parking has not changed much since years past. The new additions to parking for students this year, besides the usual spaces behind Enotah, Rollins, and Hillgrove, in front of Manget, and beside Winship, are the few spaces in front of Maxwell, spaces behind the old gym, and of course, the Annex across the street. Right now, these parking spaces are enough. According to Susan Rogers,vice president of student development, there are458 parking decals registered to students. That number is to date, meaning it can change at any time. So, right now, we have enough parking. The only problem now is the inconvenience of some of the parking spots. “Everyone, obviously, would not just like a place to park, but also a convenient place to park,” said Rogers. But what happens when our problem grows from just inconvenience, and more of the six hundred plus students start to bring their vehicles to campus? As of right now, no plans are in place to relieve the parking pressure the students feel on campus. “While there are long term plans for places, nothing is going to happen immediately,” said Rogers. So for now, not only residents, but also commuters, faculty, staff and visitors will just have to duke it out to find parking around campus, or park in the Annex across the street and walk. Once students find a place to park, they must make sure it is the right place to park. Depsite not all of the lots having proper signage in front of them and some of the lotsnot having any signage at all, all vehicles were ticket-enforced starting on August 27. In fact, most the complaints made to the Student Government President have been about warnings being put on student’s vehicles, when they thought they were in a proper spot. So until parking areas become permanent, everyone is going to have figure out where to park, and hope a ticket does not show up on their window.